Many thanks to Vanessa, Virginia and Patti for their help in testing this pattern. Small popcorn (sm pc): Work 3 dc in stitch, remove hook from yarn, insert hook in first dc of the group, pull the dropped loop through the first dc. Large popcorn (lg pc): Work 4 dc in stitch, remove hook from yarn, insert hook in first dc of the group, pull the dropped loop through the first dc. 1. Read instructions all the way through before beginning bag. 2. I used partial skeins of Red Heart Super Saver. 3. 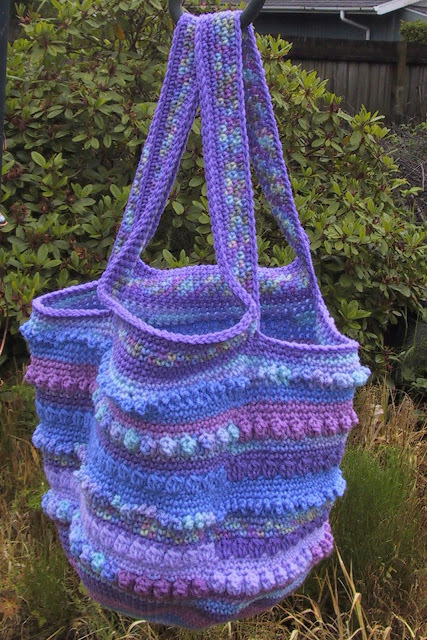 The single crochet rounds give the tote structure, so don’t shortcut it and use double crochets. 5. The handles in the instructions are long enough for over the shoulder, if you want shorter handles only chain 40. For the smaller bag skip the next 2 rounds and contine with pattern starting at round 19. From here on you will be joining rounds. Slipstitch in next st.
Poke the ch 4 loops of round 33 through to the right side. Working on the opposite side of the ch 70 and the skipped 24 stitches, slipstitch in each st of handles. 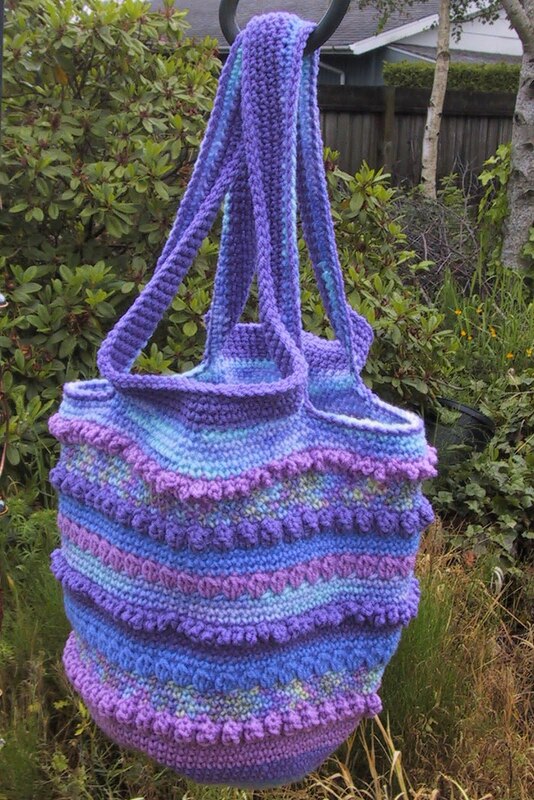 Dang, just when I think you can not come up with another new tote/bag idea, you do! Thanks SO much!